CARMEL, Calif. -- The vandalism that occurred at the Carmel Mission Basilica over the weekend is now being investigated as a hate crime. 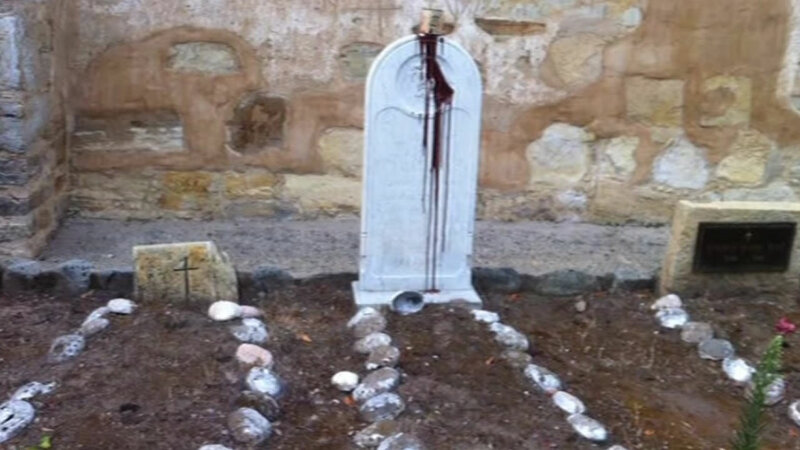 Just days after the canonization of Junipero Serra by Pope Francis, the Carmel Mission Basilica was struck by vandals, knocking down Serra's statue and covering it with paint. Several other historic statues, gravesites, doorways and a fountain were vandalized. The suspects wrote "Saint of genocide" on a rock referring to Serra who was buried there. Police believe the vandalism occurred between Saturday evening and Sunday morning. A volunteer discovered the damage on Sunday morning and contacted the Carmel-by-the-Sea Police Department. The canonization of Serra was controversial with some Native Americans criticizing his treatment towards their ancestors. Carmel Mission officials have asked for volunteers to help with cleanup on Monday. Officials said the estimated damage is $50,000. Police are asking anyone with information about the suspects to call the police department at (831) 624-6403.